The Africa Rice Center (AfricaRice) has launched a powerful new decision-support tool, called ‘RiceAdvice-WeedManager,’ to help African rice farmers find the most effective and cost-efficient weed management strategies, matching their specific farming conditions and available resources. Potentially all rice farmers in sub-Saharan Africa (SSA) can benefit from this interactive tool as it can be used across rice-growing environments, from rainfed uplands to fully irrigated lowlands, leading to significant improvements in efficiency, productivity and incomes. Weeds are serious constraints to rice production in SSA across all rice environments. AfricaRice surveys indicate that farmers perceive weed infestation as the predominant biotic constraint to rice production in SSA. Annual weed-inflicted yield losses in rice are conservatively estimated at 2.2 million tons per year in SSA, resulting in at least US$ 1.5 billon losses per year. It is estimated that improved weed control, when combined with good soil fertility management, can raise rice yields by 1 ton per ha. Improved weed management is therefore vital to prevent losses in rice yield and production costs. For this, rice farmers in SSA need timely and reliable advice to make better decisions on the most appropriate weed control options. But at present they have limited access to such information. The WeedManager app has been developed in close association with Co-Capacity, The Netherlands, with support from the CGIAR Research Program on Rice Agri-food Systems (RICE). It is strongly based on research findings of AfricaRice and its partners, who have long been involved in developing efficient weed management strategies that are affordable and feasible for resource-poor rice farmers in SSA. The app is now being field-tested with farmers in Nigeria and Tanzania with the help of the Competitive African Rice Initiative (CARI), commissioned by the German Federal Ministry for Economic Cooperation and Development (BMZ). “We are planning to organize training in the use of WeedManager app, which is an exciting tool for weed management,” said Dr Kazuki Saito, AfricaRice Agronomist. The app provides a range of adapted recommendations for weed management – before, during and after the main rice-cropping season – based on information entered for each participating farmer relating to his/her field conditions, available resources (financial, human and natural resources and equipment) and prevailing weed problems. Each farmer decides which of the recommendations to adopt and can then be further advised and monitored by service providers. “The WeedManager app stimulates adoption of targeted and integrated weed management practices by smallholder rice farmers in SSA, helping to reduce their reliance on manual weeding. This contributes to sustainable productivity enhancement leading to food security and income generation,” explains Dr Jonne Rodenburg, former AfricaRice agronomist, who has spearheaded the development of the WeedManager app. Dr Rodenburg is currently Senior Lecturer/Researcher Agroecology at the Natural Resources Institute (NRI) of the University of Greenwich, United Kingdom. The WeedManager app can be used by farmers, extension workers, private companies involved in rice agri-business, development agencies and other stakeholders in Africa, who are interested in getting expert advice on weed management for rice production. It can also open opportunities for young professionals to serve as service providers by delivering personalized recommendations generated by the app to smallholder rice farmers and by assisting farmers during the implementation of the recommendations. The WeedManager app can be freely downloaded from the Google Play Store on any Android device (smartphone or tablet). It is available in English and French, and other language versions are planned. 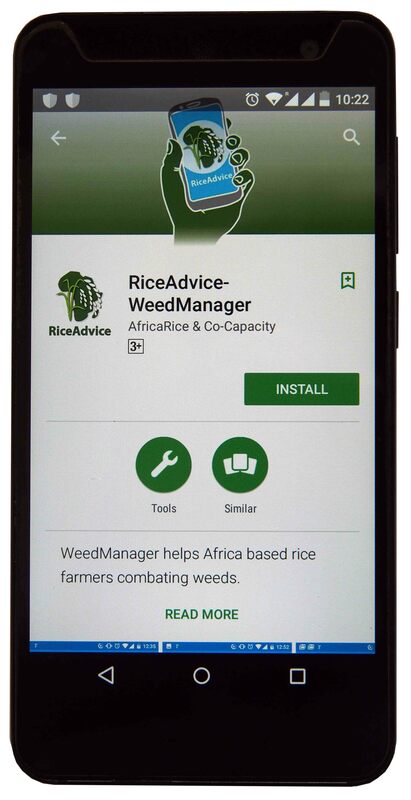 The WeedManager app uses the same login data as the RiceAdvice app earlier launched by AfricaRice.